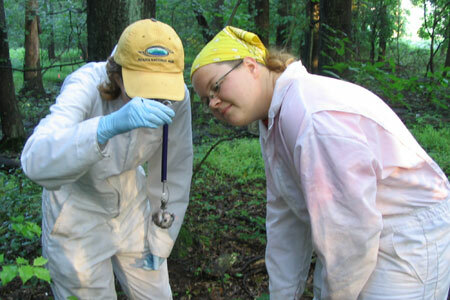 The Hutcheson Memorial Forest Center is excited to announce the new annual research symposium! The symposium will occur each spring and is open to the public and all Rutgers Faculty, Staff, and Students. The HMF Center Research Symposia will highlight the scientific investigations taking place at the Center and provide researchers the opportunity to learn about each other's work. Abstracts for past Research Symposium presentations can be viewed by following the link on the right hand side HMF Research Symposia Abstracts. Keynotes will be followed by lightening talks given by Ecology and Evolution Graduate Students performing research at HMF. Symposium Agenda Download link (PDF). Explore recent research efforts presented at the annual HMF Research Symposium. The HMF Center is proud to support a cohort of student research fellow every summer. Check out past projects or apply to be a fellow this summer!